During the war, Norbert Riedel had created a two-stroke starter engine for aircraft. In the immediate postwar Germany, he responded to the need for small and simple and inexpensive transportation. He designed a spine/backbone frame that was easy to construct from the steel tubing available during that time. He designed a single-sided swingarm, and a single-sided front fork that not only cut down on weight, but allowed for interchangeable wheels front and rear. The rear swingarm also served as the exhaust. The rear suspension featured a horizontal spring which acted upon a triangle formed by the frame, the rear fender support, and the swingarm. This produced a simple yet elegant look for the whole machine. The engine was an oval-shaped two-stroke single cylinder motor with an integrated cylinder and head. It jutted out from beneath the spine frame as if suspended in air. It produced 4.4 hp at 5800 RPM, which was an impressive number at the time for a motor that was just 99 cc. Following successful tests of the prototype in 1947, Riedel AG was formed in 1948. Production moved to Immenstadt, and provided the inspiration for the logo and model name of the machine Imme (Bee in German). Margins were never good on the machine, and Riedel planned to make it up in volume. They were doing fairly well with about 10,000 machines sold by 1950, but then warranty issues emerged with the crankshaft, and any margin was quickly consumed. They were forced to file for bankruptcy and close the doors in 1951. Norbert Riedel later went on to work for Triumph and Victoria. The innovations on the IMME R100 are many. It influenced machines for decades to come, and in fact still does today. 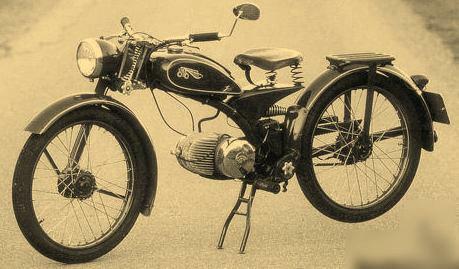 The engine was also sold to other manufacturers at the time, single-sided swingarms are common today, but not in 1948. Single-sided forks are still an exotic custom feature. Horizontal suspension, compact transmissions, the list goes on. But most of all, despite its price point, it was put together as a practical conveyance in a way that was artistic and elegant. That is why it still occupies coveted space in shows and museums today.